Test your adrenaline with this epic rock-climbing challenge at Svolværgeita in Lofoten Islands, Norway. 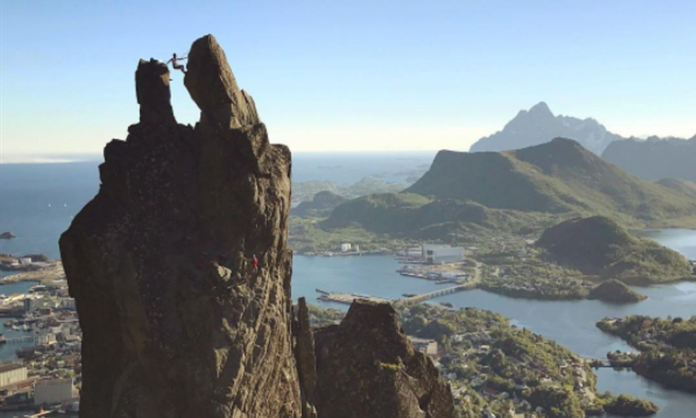 The giant rock is labeled as the most extreme activity in Norway for the challenging part does not start when a hiker ascends but rather when climbers reach the pinnacle. Svolværgeita or The Svolvær Goat is the dominant symbol of Lofoten Islands and has two distinctive spike on top called Storhornet and Lillehornet which resembles horns of a goat. Upon reaching the peak, catch a sight of the sweeping view of the entire island. However, everything does not look easy as it actually is because climbers need to technically climb 40 meters to outstretch one of the horns before they make a petrifying move: to jump 1.5 meters distance in between the horns while looking at the whole Lofoten Islands.